Since crawling out of addiction and back into the spotlight in the late ’00s, Eminem has found a slam-dunk formula for radio play. He snarls a few verses out of his clenched larynx, pairs them with a brooding hook from a pop singer and swollen power-ballad production, then retreats back into his hoodie and calls it a day. The resulting hits haven’t always been pretty, but with Eminem still doing numbers rarely seen since the CD bubble burst, there hasn’t been much incentive for him to shake things up. The first single from his Marshall Mathers LP 2, then, is the last thing anybody expected from the rapper at this point: a genuine risk. 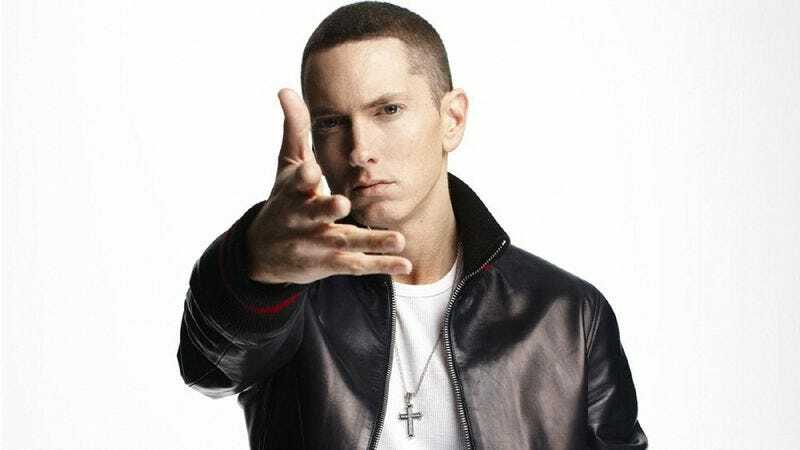 A blaring, riff-smacked Licensed To Ill homage produced by Rick Rubin, “Berzerk” celebrates the type of white-boy rap Eminem purposefully avoided early in his career, when for fear of being branded another Vanilla Ice he reminded the world of his ties to Dr. Dre at every possible turn. Part of that effort meant distancing himself from The Beastie Boys, as well, but “Berzerk” leaves no doubt that the Beasties’ records meant as much to him as N.W.A’s: Eminem hasn’t sounded this invigorated and at home since his TRL heyday. Who knew the guy was even capable of having this much fun anymore? The Marshall Mathers LP 2 stops short of delivering the all-in, golden-age throwback that “Berzerk” left critics salivating for, but it’s dotted with enough callbacks that the single doesn’t feel like false advertising. “So Far…” slashes up an old Joe Walsh guitar riff à la Jam Master Jay, while “Love Game” channels 3 Feet High And Rising in its flip of Wayne Fontana’s oldies staple “The Game Of Love”—the album’s second most-prominent sample from that era, behind The Zombies’ “Time Of The Season” on “Rhyme Or Reason.” Eminem uses that one to rap several bars in a goofball Yoda impression that owes nearly as much to Biz Markie as it does to Frank Oz. The overall mood is lighter and more agreeable than anything Eminem’s released in ages. The Marshall Mathers LP 2 is Eminem’s first album since his hiatus that doesn’t feel completely at the mercy of his inner demons. Even when musing on his usual traumas, he does so with uncharacteristic acceptance. On the naked ballad “Stronger Than I Was,” he reconsiders a breakup and concludes he’s better for it, and on the requisite track about his mother, “Headlights,” he extends her an olive branch, apologizing for years of character assassination. Eminem hasn’t kicked all of his old habits. He still brandishes his signature homophobia, and he still delights far too much in cheap, outdated references. (Some of the groaners, in reverse chronological order: the “ugly Kardashian,” Insane Clown Posse’s magnets, Britney Spears’ unstable period, Gwen Stefani “selling out,” Monica Lewinski, Jerry Mathers, and Helen Keller.) But after years of stagnancy and tedious anger, he shows real growth on The Marshall Mathers LP 2. Eminem has always rapped with forceful determination out of the compulsive drives to prove himself to doubters, cut down his enemies, and retain his commercial foothold. For the first time in far too long, he sounds like he’s rapping because he enjoys it, too.